On August 19th, 2011, a 55-year-old Marion man was arguing with his 46-year-old girlfriend when he pulled out a .357 caliber revolver and shot her in the head. He then turned the gun on himself. By the time first responders arrived at the Mark Street crime scene, both the man and woman were dead. Sadly, this grim scenario has played itself out a number times in Marion over the years. “A Real Horror Story” is one such example, and the following two cases are equally bleak. On Sunday morning, November 29th, 1896, 36-year-old Henry Powers sat down to breakfast with his wife and four children at their home on Marion-Bucyrus Road just north of the city. After breakfast the two older boys went out to play while Henry and his wife, 32-year-old Katherine, along with their teenage daughter and youngest son, stayed inside. 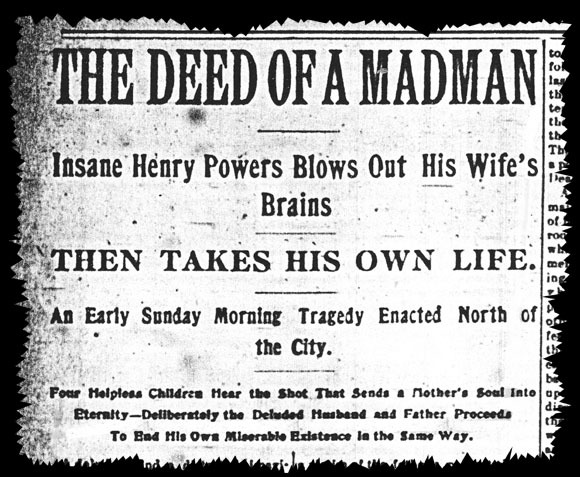 According to a Marion Daily Star article that appeared the next day, although Henry had been showing signs of an “unsound mind” for some time, on the morning of the 29th, “He [was] quiet and undemonstrative.” It came as shock, then, when Katherine and her daughter, upon hearing a noise in the kitchen, found Henry standing there with a shotgun in his hands. Both women immediately turned to flee. Mrs. Powers ran toward the sitting room and Henry followed her. The daughter, Ella, ran for the door, and it was as she was racing outside that she heard the shotgun blast. The neighbors, alerted by Ella, watched from a distance as the still-armed Henry left the house trailed, shockingly, by Henry and Katherine’s youngest boy, 2-year-old Willie. Luckily, the two older Powers boys spotted their younger brother, grabbed him and carried him to the safety of Ella and the neighbors. As they all watched, Henry Powers disappeared behind the house, and they heard a second gun blast. Incredibly, Powers reappeared a few minutes later, gun still in hand, and with blood “streaming down over his face.” He disappeared back inside the house. The original 1896 headline from the Marion Daily Star. Why did Henry Powers kill his wife and then himself? It appears the man had been mentally ill for a long time. According to the Star, most of his delusions centered around an “insane jealousy” of his wife. In May of that year, Powers had attempted to commit suicide by cutting his own throat with a straight razor. Shortly thereafter, a judge committed him to an asylum in Columbus. Five months later, however, the asylum’s superintendent, believing that Powers should given “one more chance,” released him. Powers returned to his wife and family in Marion on October 16th. He wife was so surprised that he had been released that she believed the asylum must have made a mistake. In fact, fearing that Mr. Powers was still capable of carrying out “injury to himself or his family,” she had even contacted the sheriff about the possibility of returning Mr. Powers to the asylum. According to the Star, during the week prior to the tragedy, Powers was convinced that his wife had been trying to poison him. Tragically, it seems that the only thing poisoned in the Powers household was Mr. Powers’ mind, and ultimately the Powers family paid the price for it. On March 27th, 1948, 40-year-old Charles Gerstenlauer called his wife from a pay phone at Five Points, a lunch room and filling station once situated where Route 309 and Route 98 meet. In a disturbing conversation, Mr. Gerstenlauer told his wife, 38-year-old Elsie, that he was going to “do away” with himself and their two small children. The Gerstenlauers were in the middle of a particularly ugly divorce, and Charles, against Elsie’s protests, had taken the children earlier in the day from their home and disappeared. Immediately after receiving the call, Mrs. Gerstenlauer alerted authorities, and the search, which included members of the city police, the sheriff’s department and the highway patrol, got underway. However, by the time authorities located Mr. Gerstenlauer, he had already carried out the unthinkable. Charles and Elsie Gerstenlauer had married in 1943 in South Carolina and moved to Marion in 1945 to take over Acme Dry Cleaners on Olney Avenue. In Marion, however, things seemed to sour for the couple, and in 1947 Elsie consulted an attorney about getting a divorce. On May 20th,1947, she filed for divorce, citing “gross neglect and extreme cruelty.” In fact, on the morning of the 27th, Mr. And Mrs. Gerstenlauer had been in court over Mr. Gerstenlauer’s violation of a restraining order. Less than a quarter of a mile north of Route 309, a railroad crossing cuts across Route 98. John Dairy, the foreman of an Erie signal repair crew that was working in the area at the time, told the Star that he had noticed Mr. Gerstenlauer driving back and forth across the tracks all afternoon and thought it was a bit strange. The May 28, 1948, headline from The Marion Star. The train, which was an Erie passenger train called the Lake Cities, was heading east and bound for Jersey City. By the time it was nearing Route 98, it was traveling at around 70 miles per hour. Mr. Gerstenlauer was thrown 200 feet from his car while the children were later found in it. Charles Lowe, the train engineer, told the Star that, “It was the awfulest thing I’ve ever seen in almost 40 years of railroading. I’ve been riding engines when they hit cars before, even people walking, but when I saw those two little girls it really hit me.” One has the impression Mr. Lowe and the other witnesses would be haunted by what they saw that day for a long, long time.